I can't believe it; the BBC Television Studio is closing down. All the radio channels have already moved to the Broadcasting House in central London, while sports and children's programmes are now produced at MediaCityUK in Salford Quays. It will be a sad day indeed when the studio finally closes its doors, but if you want to make the most of our long-lived studio while you still can, why not take your children on a tour of the building. There are adult tours available as well, but this one is especially aimed at kids 6 - 11 years old. There isn't long to go, as they will only continue running until 22nd February 2013, so you'd better hurry and book if you want one last chance to see the iconic studio. 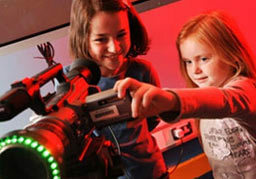 It is a truly interactive tour, where children will have the chance to make some of their very own television shows. They could also take part in a a version of CBBC's Copycats show, which involves two teams battling it out in a range of fun games. In addition, there is a Gory Games activity area. You will be taken around some of the former children's show studios, such as the Blue Peter set and for the sports fans, Match of The Day. The two hour tour is £11.75 for adults, £10.75 concessions, £9 students, and £8.25 for children.